The future that author James S.A. Corey presents here is akin to the Wild West – a gritty, messy look at population expansion beyond Earth. There’s a reason why we’re all still screwing around on the rock we were born from; living in space is hard. Literally everything needed to support life is on this planet and this planet alone. Space is a cold, unforgiving place – “a hard vacuum”, as many characters call it, and survival is dependent on factors which require political discourse and trade agreements, so the ongoing threat of war is always present. 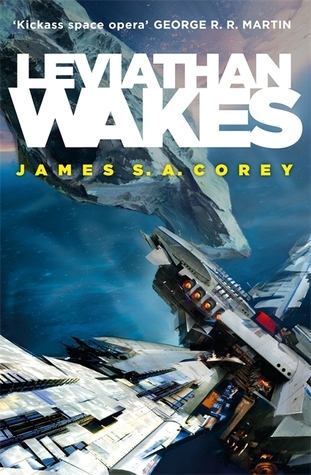 Leviathan Wakes wasn’t at all what I thought it was going to be, which isn’t a bad thing. The story shifted and changed so often over its nearly six-hundred page length, that I was never bored. I think my biggest enjoyment came out of the fact that the story didn’t get bogged down in the technicalities of how space travel, colonization and all that stuff actually works. In the post story interview at the back of the book, Corey admitted to labeling the novel “working man’s sci-fi”, which kept the science-y stuff light while playing up the dingy, grittiness of space travel. That’s what I enjoyed the most and likely why I loved the TV show Firefly so damn much. The novel’s two protagonists, “Earther” James Holden and “Belter” Detective Joe Miller, had their own story lines that played out in dueling chapters – a direction that worked really, really well. While Miller was a little more world weary and downtrodden than Holden, both had their insecurities that made them two sides of the same coin, so the shift from one viewpoint to the other was rather fluid. That being said, while I was happy the technical side of things was kept light, some of the characters weren’t quite as complex as I would like them to have been. Alex and Amos merely existed for quips and jokes (although they did have me laughing) or to play devil’s advocate for Holden’s tougher decisions, which is fine but didn’t give them any lasting appeal or cause me to miss them when they weren’t around. Even some of Holden’s past decisions with regards to relationships seemed rather cliche and while I’m a sucker for the boozing, brooding detective, Miller managed to feel a little disingenuous at times. Leviathan Wakes was still a compelling read. You know a book is good when you’re sitting in your cubicle at work, unable to wait until you get home to read more. I grabbed the box set of the first three books so I picked up Caliban’s War as soon as I put down Leviathan Wakes. On to book two!